No church history is complete without some reference to the ground into which the seed was planted. The seed of the Episcopal Church in Sanilac County, Michigan, was planted in 1868 in fertile soil. However, as those who have worked with crops know well, it takes more than fertile ground to bring that first sprout from pod to full corn, for if the earth is not well tended, weeds will soon choke out the vegetables and flowers. It takes people with dedication to cultivate the garden, as it took people with dedication to cultivate the spiritual garden in those early days, making it possible for the Episcopal Church to continue its existence in Lexington and to grow in influence. Many denominations have attempted to establish themselves in Lexington, but only a few have survived. Among those which fell along the wayside were the Presbyterian, Congregationalist, Baptist and Advent-Christian Churches. An attempt was made to establish the Lutheran faith early in the history of the village, but it came to naught. However, the Lutherans became firmly entrenched in Pine Hill, approximately six miles north of Lexington, and in 1948 they reestablished themselves in the Lexington area and now are here to stay. The Methodist and Roman Catholic churches were successful from the start. According to the SANILAC COUNTY PORTRAIT AND BIOGRAPHICAL ALBUM, (SBA), published in 1884 in Chicago, on which the writer has placed heavy reliance for information concerning the early history of the church and of the village, Sanilac County was first mentioned in official records in the "Territorial Laws of 1827". The county area had not even been surveyed then. The origin of the name of a Frenchman who was in the area late in the 17th century, when Michigan belonged to France (SBA, page 459). Other historical sources claim that it is based upon an Indian name. The actual settlement of Lexington, which was originally called Greenbush, probably cannot be claimed to have taken place until 1838, although it is known that there were people in the area before that time. Actually, Worth Township was first settled in 1834. Worth Township begins at the Sheridan Line, one-half mile south of the Lexington village limits, and extends to the county line, which is 6 1/2 miles south of the village limits. In 1836, Reuben Dimond built a log house just south of Lexington (SBA, p. 454). The town of Lexington was first inhabited by a Mr. John Smith who came from Canada in 1837. His name appears on a number of abstracts of property in the Anson Simons Plat of Lexington, bearing the date of 1836. He lived in a log cabin by the lake and had twelve children. Then, as the area began to attract more settlers, he picked up and moved on (SBA, p. 455). It is believed that Mr. Smith hunted and fished in the area as early as 1835, and perhaps even in 1834, but if he did, he made no permanent improvements to the land. The state legislature established Lexington as the Sanilac County seat in 1849. In 1879, after a long and bitter struggle by Lexingtonians and others along the Lake Huron shore to retain it, the county voters decided by a very small majority to shift the seat to the geographical center of the county -- a hamlet named Sandusky. The move was completed in 1880. From that time on, Lexington began to die -- slowly at first, and then in the 1900's at a more rapid rate. The railroad bypassed the town in favor of Davisville (Croswell), five miles inland, a fact, which discouraged industry, and the means of employment gradually moved elsewhere. In 1940, the US census recorded only 326 permanent residents within the corporate limits of the village. After World War II, however, the village began to grow again, and in 1970, the census recorded 834 inhabitants within the village limits. Many more residents are scattered up and down the lakeshore, adjacent to Lexington, so that within a narrow belt of land from approximately seven miles south of town to four miles north of it, the general area now served by the Lexington Post Office, there are approximately 2,000 year-round residents (as of 1975) -- hardly a megalopolis, but certainly many more than lived here 100 years ago. In 1868, An Episcopalian and a man whose religious background was not sympathetic to the Episcopal Church began a Sunday School in quarters then owned by the Masonic Lodge (SBA, p. 512). That building, no longer in existence, was located on Main Street just south of the creek, which flows past the present St. Denis rectory. It was natural for the Episcopal Church to seek quarters from the Masons, for the two bodies have historically had cordial relations and close ties. Freemasonry was sometimes tolerated for brief periods in Roman Catholic countries in Europe, but for the most part it was an organization despised and feared by Catholic rulers. Even the Lutheran Church in the Protestant part of continental Europe would have nothing to do with Freemasonry. The Church of England, however, felt Masonry was an extension of the faith, and to this day, even in the United States, it is not uncommon to find Masonic paraphernalia and Episcopalian accoutrements for sale in the same supply catalogues. In addition to Lexington, a mission was also begun in Davisville, in 1869, at the behest of Mrs. Wildman Mills (SBA, p. 512). In 1870, the Davisville Mission, known then as Christ's Church, built a fine wooden building west of Black River (SBA, p. 512). Mr. Wildman Mills operated a lumbering firm and donated generously in money and material) to the church. The Lexington congregation, known as the Church of the Good Shepherd, became a parish in 1871, but it wasn't until August 1874, that the cornerstone for a church building was laid. Mr. Flower had continually encouraged members of the parish to get busy and build a church. The Masons were about to build a new structure in cooperation with the village and township of Lexington. Attempts had been made to secure the vacant building on Union Street owned by the Free Will Baptists, but the Baptists refused to sell. Minutes of the parish vestry tell us that in February, 1874, the vestry voted to adopt Plan 2 according to the Rev. Wm. Evarts' book of Plans for Church Buildings. The church was supposed to seat about 200 and would be built of wood - then in plentiful supply. The rector was designated a committee of one to solicit subscriptions and otherwise to raise money. The Young Ladies' Society had donated the money for the lot on which the new building would be built, at the northwest corner of Main Street and Hubbard Street. It was stipulated that the interior was to be finished in ash and butternut. When the church building was finished in 1875; it did not look exactly as it does today. There was no false ceiling inside, nor were there any pews. Presumably the congregation sat on chairs or benches. The tall spire above the narthex wasn't there. There must have been a shorter tower, for after the church was struck, by lightning in August, 1887, the vestry met and after deliberation of about a month's duration, passed the following resolution: "That the tower should 'be raised to a sufficient elevation so that the bottom of the bell will be as high as the peak of the roof and finished with a spire in proper proportion." It was important in those days that the bell be heard al I over town. There were two "bells" for each service: The "first bell" was rung a half-hour before the service was to begin, and the "last bell" was rung just as the service started. The Journal of the Diocesan Convention of 1871 lists three missions, which were admitted as parishes. Those were St. Paul's Church, Elk Rapids, Antrim County, and Church of the Good Shepherd, Lexington, Sanilac County, and Christ Church, Davisville, Sanilac County. The Elk Rapids parish was transferred to the Diocese of Western Michigan when the latter was established in 1874. The Rev. Mr. Flower continued his missionary activities around the county until 1875, when he resigned to accept a call to Marine City. His account of a prayer meeting at a lumber camp in 1871, as printed in the Journal of the Diocesan Convention of that year, hits a very poignant note: "Last Winter (I) officiated at two services at a lumber camp 27 miles from this village, where (I) held the most interesting services of (my) life. About one hundred men were present. Long will the impressions produced linger in the memory. As the old story of the prodigal son was rehearsed, and applied to those who for months had been absent from home, tears were in many eyes unused to weeping, and voices not often raised in prayer uttered the words, "We have erred and strayed from thy ways like lost sheep." May they all be gathered at last into the fold of the Good Shepherd, and with all the redeemed praise God for 'the means of grace and the hope of glory." The Episcopal Church grew and prospered in those early years despite some difficult times when the nation went into what we now call "economic recessions". Whenever the recessions occurred, members of the congregation who had subscribed specific amounts to pay the rector's salary were forced to renege on that promise. The ultimate result was that the clergyman was either forced to resign and seek another parish, or to starve. In every case, resignation proved to be the wiser decision. In 1871, eight persons were confirmed. In 1891, the Bishop confirmed the following persons in Lexington: Margaret Bell, Mrs. Daniel Clarke, Mr. Daniel Clarke, Amelia Colbeck, James Colbeck, Emma Fead, Nellie Fead, Anna E. Henry, Mrs. Martha Henry, Miss Alice Miller, Bertha Miller, Frank Neggeman, Charles Francis Smith, Miss Tewksbury, Frederick Walther. The vast majority of these confirmands remained active in the church, either in Lexington or elsewhere, for the remainder of their lives. There was no parish hall until 1949, so Sunday School was held in the church building at different time from Sunday services -- usually in the afternoon. Several classes met in the nave of the church, and a couple of classes met in the Vestry Room wing on the south side of the building and in the Sacristy wing, which has since been removed, on the north side. Of this latter amount, $54.75 was collected specifically for the "Relief of Michigan Fire Sufferers", following a great fire which devastated the Thumb area of Michigan. The Sunday School offerings for the same year totaled $36.53 for its own purposes and $1.65 for Diocesan Missions. For many decades after the parish was established, the rector's salary was in the neighborhood of $500.00. The amount seemed to vary from time to time, but not by much. The indebtedness of the Church of the Good Shepherd was considerable in 1881: $550.34 was still owed for the new rectory and lots on which it stood, and $178.78 was owing on the rector's salary as of the end of the year. Yet, one wonders how the church was able to gather in the amount which it did, for services in the early 1880's were held in Lexington only every other Sunday. And the rector was present in the parish for only 10 months of the year. Such a situation would seem unconscionable to us today, but it was apparently the rule for small, struggling churches in the latter part of the 19th century, and the rector at that time, the Rev. John W. Clark, conducted himself in a manner that was no exception to the rule. One result of such a situation as that mentioned is that a rather independent spirit was nurtured in the congregation. It was accepted as normal that unless members of the congregation took for themselves a lot of responsibility for running the church, seeing to the services, running the Sunday School and meeting the guilds, there would be no church. Sometimes two forces came into conflict as might be expected: a rather independent congregation and a strong-minded priest. "Rev. Robert C. Wall", rector of the Church of the Good Shepherd, died at his home in this village Tuesday afternoon, Nov. 28, '05, at 6 o'clock, in the 82nd year of his age. For the past 12 months his health had gradually failed until it culminated in his death. He was an illustrious man, stern in his ideas of justice, but no one brought to the discharge of his high duties a loftier conception of the right, cleaner hands, purer patriotism, or a stronger and more patient diligence. What he did as a minister of the Gospel of Jesus Christ was done according to his high conception of duty and with painstaking thoroughness. In the dim and misty hours of the evening, while the world was being gradually hushed, the soul of Robert Carter Wall joined the great majority. His life had ever shown a serene and all-sufficient faith in the promises of his Redeemer, and he laid aside the burdens of this world, its affections, its hopes and its ambitions, and obeyed the summons of his Maker. The spotless character he has left behind stands as a lasting monument for others to follow. For ten years the writer of these lines has enjoyed his unbiased friendship, his confidence and esteem, and today we commemorate his virtues, speak kindly and affectionately of his memory, and send out to his people and to all those who value the recognition of merit and nobility this humble testimony of our enduring regard for a well spent and virtuous life. "The body will lie in state this early forenoon at the Church of the Good Shepherd. The funeral services will be held at the church at 2 o'clock p.m., conducted by the Rev. A. Kenny Hall of Port Huron and Rev. Wm. Stimpson of Caro." (From an undated clipping of the Lexington News, 1905). The writer of this glowing tribute was Mr. J. H. Keyes, editor of the News. A descendant of Mr. Keyes, Mr. Ned Henry, is an active member of the parish today. The remains of Mr. Wall and of several members of his family are buried in the Lexington cemetery. He is one of only two rectors of the Episcopal Church in Lexington to be buried there. The other is the Rev. Benjamin Baxter, who died elsewhere in 1923. His remains were returned here for burial. When the Episcopal Church in Lexington was experiencing its golden age at the turn of the century, the town of Lexington was beginning to be discovered by a different element of people. Wealthy Detroiters found the unspoiled beaches of Lake Huron to be to their liking, and cottages were built along the lakeshore. Summer colonies were thus established, and there began to form summer congregations in the Lexington churches. The Cadillac Hotel was usually full in the summer time, and many permanent residents rented out rooms by the night or week to tourists. Henry Ford drove his white Model-T car to Lexington and once was met by about half the town waving banners asking him to build a factory here. And later on, the University of Detroit football team worked out at the fairgrounds (site of the present Municipal Trailer Park). Following the departure of the Rev. Benjamin Baxter in 1912, the Church of the Good Shepherd went through several decades of instability, which almost resulted in its having to close. Services were held during the summer months, to be sure, but during a few winters, the church was closed, except for Sunday School classes. St. Anne's Guild also continued to meet regularly. Clergymen from Croswell conducted services, sometimes on a regular basis, and sometimes on an occasional basis. The Lexington parish was not the only Episcopal Church in the area to experience difficulty during these times. While a new mission did open in Sanilac Center (Sandusky), churches in Vassar, Caro and Gagetown closed. There was even a mission in Deckerville, which from all accounts was short lived. The Church of the Good Shepherd might have been forced to close its doors forever during the great depression of the 1930's had it not been for a very unfortunate incident which occurred in its sister church in Croswell. In the late 1920's a dispute arose in the Croswell congregation. Generally speaking, the issue of "high" church versus "low" church was the heart of the matter, as was the issue of wealth and power. It all came to a head when some seven-branch candelabra were presented to the church. The candelabra, considered "popish" by the wealthy low churchmen, mysteriously disappeared and were never found. A major split developed, and there was a mass defection on the part of members to different churches in Croswell. Christ Church, Croswell, closed in 1929 and remained closed until November 7, 1937. The Bishop then paired the Lexington congregation with St. John's Mission in Sandusky, 26 miles distant, and sent the Rev. John Adams Alford to the latter town in December, 1929, to minister to what was now called "the Sandusky Mission Field". Mr. Alford was a graduate of Nashota House, the church's only really "high" church seminary. He left in January, 1935, to become rector of St. Hilda's Church, River Rouge. At that time the Church of the Good Shepherd was so poor that he saw fit to donate his final month's salary to the vestry - a mere gesture, for surely he wouldn't have received it anyway. Sociologists tell us that the great depression was on its way out in 1933, and within a few years it was allegedly licked. But those of us who lived in Lexington during the 1930's know differently. The depression wasn't over for us until America began to tool up for World War II. Things began to improve slightly, but unemployment remained very high. And at that time there was no industry in Lexington, unless commercial fishing can be called an industry. Contributions to the church reflected the general economic picture of the community. The Bishop of Michigan at that time, the Rt. Rev. Herman Page, still had hopes for the area, however, and in 1936, he sent the Rev. E.T. Rodda to Sandusky, with charge over Lexington, also. Mr. Rodda stated that it was his firm intention to reopen the Croswell Church. The Bishop informed him he would receive no help from the Diocese. But try he did and succeed he did. He began to call on families in Croswell, and enlisted the help of his wife and of interested Episcopalians in that town, and as a result of sheer determination, Christ Church was reopened for services. Now there were three churches in the Sandusky Mission Field. Of the three, Sandusky was the largest, but none were really what one might call large. In their respective communities, the Episcopal Church was the smallest church in town. But Episcopalians kept the faith! The magnificent language of Thomas Cranmer, the Archbishop of Canterbury who was responsible for the first English Book of Common Prayer, was read every Sunday from the chancels of three Sanilac County churches and was heard by a people determined that their faith should grow, not die. After World War 11, the character of Lexington began to change and the area started to grow again. By 1947, it became apparent that the Sandusky Mission Field would have to be divided if it were to be effectively served, so with the departure of the Rev. F.C. Trussell, Croswell and Lexington were severed from Sandusky and shared their own clergyman who resided in Croswell. Later on, the rector was to live in Lexington, and then still later he returned to Croswell. In 1968, Croswell and Lexington severed their connections and each employed its own rector. The Rev. Emery F. Gravelle became the first rector of the Church of the Good Shepherd, alone, since the departure of Mr. Baxter in 1912. A new rectory was purchased a mile and a quarter north of Lexington, on Southside Drive, for the new rector. Difficulties in both the Croswell and Lexington congregations made it evident that the two churches could not continue as separa ies, so, effective in January, 1972, the two parishes dissolved their old corporations and formed a new parish known as Trinity Episcopal Church. The Croswell-Lexington parish operates two chapels, but regular services are held in the century-old Lexington building, only. As of 1975, the Rev. Bertam T. White is a rector of the parish, and he resides in the Southside Drive rectory, which he is purchasing from the parish. The old rectory, north of the church, is vacant. 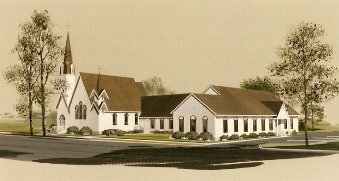 Thus it is, in 1975,107 years after its roots were planted, and 101 years after the cornerstone for the church building was laid, that the Episcopal Church is still at home in Lexington. But it is a Lexington with a difference, for now the sense of a tightly-knit community, such as existed in years gone by, is no longer in evidence. Lexington, rather than being a nearly mile-square area, is a vaguely defined territory which stretches up and down the shore of Lake Huron for several miles. While its population contains many of what might be called "transient" families, there is also to be found a devout core of newcomers who plan to spend the rest of their lives here. They have taken hold in the community and in the church - which they now regard as their own, and which is as dear to them as it is to those who have always lived here. It is this new life and new leadership, starting with the rector and continuing through the vestry right down to the "man in the pew", which augers well for the future of the parish. For with the leadership and combined membership, the church will surely surge on into another golden age. Lexington's sister city - Croswell -five miles to the west, is now as close to the average resident as the old grist mill run by Nicholas Wolfel was 100 years ago. Many community institutions, including the public schools, have merged. Trinity Episcopal Parish has become the first religious body to do so, and now it looks forward to serving both Croswell and Lexington in the third century of the life of our nation.